The proposed agency budget for fiscal year 2011 has been released by Metro staff. Here is a link to the budget, which is posted on the Metro website (pdf). It will be discussed at a special meeting of the agency’s Board of Directors on Wednesday, May 19, at Metro headquarters. The Board of Directors are then scheduled to vote on the budget at their regular monthly meeting to be held on Thursday, May 27. The fiscal year runs from July 1, 2010 until June 30, 2011. The agency was facing a $181-million shortfall in its budget planning — the actual shortfall was originally thought to be much more. The proposed budget eliminates the shortfall through layoffs, wage freezes and about a five percent bus service reduction. 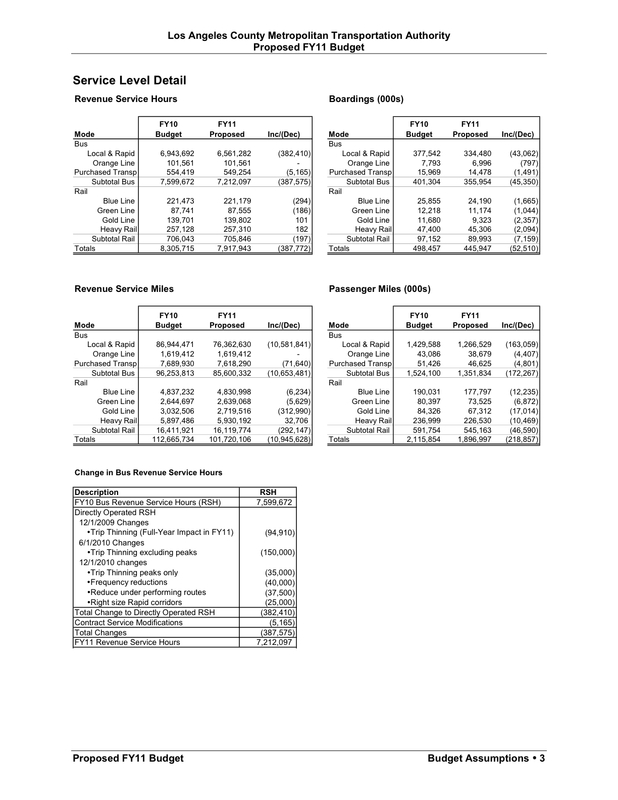 The page at right, taken from the budget, shows the proposed service levels for the next fiscal year. The proposed FY11 budget assumes an initial 5% bus service reduction (387,575 Revenue Service Hours) through more efficient scheduling to reduce service duplication and improve productivity. At the same time, we will improve service quality by continuing the level of maintenance activity and on-street supervision. This will improve the state of good repair and cleanliness of the bus fleet and continue to improve bus in-service on-time performance…Rail service will remain at the FY10 level, with Expo opening in FY12. A fare increase, approved in 2007, is also going into effect on July 1, although only 48% of Metro riders will be impacted. Here’s a full list of the increases; fares remain frozen until July 1, 2013 for seniors, students, the disabled and Medicare qualifiers. Metro will hold a public hearing on a draft $3.75 billion budget for Fiscal Year 2010-11 on Wednesday, May 19, at 2:30 p.m. in the third floor Board room at Metro Headquarters, One Gateway Plaza next to Union Station in downtown Los Angeles. The public can view copies of the budget proposal at Metro.net (type in keyword budget in Search) or request a copy by calling Charlene Aguayo in Metro Records Management at 213.922.2342. Metro directors will consider adopting the budget, for the fiscal year beginning July 1, 2010, at their Thursday, May 27, meeting that starts at 9:30 a.m. at Metro headquarters. Against the backdrop of the worst economic downturn since the Great Depression, Metro has seen a sharp drop in local transportation sales taxes and farebox revenue compounded by cuts in state transit funding. As a consequence, Metro faced an historic $181 million operating deficit but CEO Art Leahy has managed to balance the budget by severely cutting administrative costs including the elimination of 20 percent of the agency’s non-contract staff, 240 full-time equivalent positions. In addition the proposed budget reflects improved capital budgeting and centralizing bus operations to improve efficiency. A five percent reduction in bus service is assumed along with a previously approved fare change that will be implemented July 1. The 5 percent reduction in bus service hours will be achieved through more efficient scheduling to reduce service duplication and improve productivity. However, service quality will improve by continuing the current level of maintenance support and on-street supervision. CEO Art Leahy has proposed a spending plan that is $99 million, 2.63 percent, less than the current Metro budget but still advances a variety of transportation improvements for the region including a spate of new highway and transit building projects. These are funded largely with federal stimulus funds and the new Measure R transit sales tax. Metro will program $600 million in local Measure R sales tax monies in FY 11. These include monies to advance planning and construction for more than two dozen transit and highway projects plus monies to subsidize bus operations and $87 million in local return monies that will be given the various cities in Los Angeles County to use for major street resurfacing, pothole repair, improving traffic congestion, bikeways, pedestrian improvements, signal synchronization and transit improvements. Among major transportation advances in the coming fiscal year, Metro will purchase 125 new compressed natural gas buses, order new rail cars, continue construction funding for the Expo light rail line from downtown Los Angeles to Culver City and a four mile extension of the popular Metro Orange Line busway from Canoga Park to Chatsworth, oversee construction of a 10-mile northbound carpool lane on the I-405 freeway from the 10 to 101 freeways and advance numerous planning studies for new transit projects throughout Los Angeles County. Construction of an 11-mile Foothill extension of the Metro Gold Line from Pasadena to Azuza also will begin this summer.